Solar power is basically the process of harnessing the light coming from the sun using a group a Photovoltaic cells known better as Solar Panels. Solar Panels installed in homes were a rarity as recently as a decade ago. But thanks to federal tax credits and local incentives along with increasing worries about climate change have made them commonplace. Did you know that installing solar panels can decrease your household’s carbon footprint by an average of 35,180 pounds of carbon dioxide per year! You’d have to plant 88 trees every year to offset that amount of carbon dioxide! 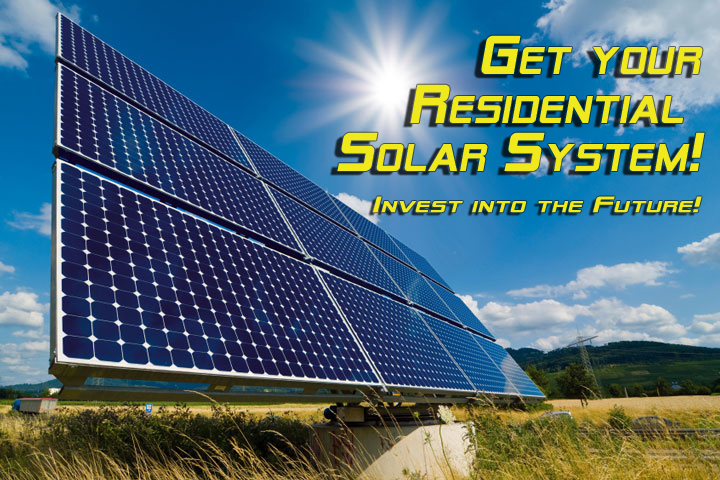 Get your customized solar system now! Start saving money and the environment at the same time! 1) Solar panels are photovoltaic (PV) cells that are installed in your house roof and harness sunlight and transform it into energy. 2) The energy is send to an inverter, which converts it into electricity to power the home. 3) Net metering measures the amount of energy being produced vs consumed and keeps monitoring power production and consumption. By doing this your Utility company, buys from you the excess of the energy your Solar Panels System is producing and you are not using. This Way you save money in your monthly utility electric bill! By implementing the use of cheap,renewable and clean alternatives sources of energy such as Solar Power, we are starting to reduce the emissions of toxic gases in the atmosphere,the pollution in our rivers, and we are contributing to the water conservation so much needed in Nevada. Solar Energy is the new alternative to pay less for electricity with out polluting the planet. We harness the Solar power from the Sun…We take it to your home!